In the eighteenth-century anatomical collections that I studied for my book, Elegant Anatomy, I occasionally found preparations of animals. These animal preparations were primarily used to gain a better understanding of birth defects that also affect humans, like cleft palate and anencephaly. The ones I saw were mainly wet and dried preparations, and seemed to have no relation whatsoever to the endless numbers of ‘stuffed animals’ in nineteenth-century natural history collections. This piqued my curiosity, and in my spare time I started reading on the history of taxidermy (‘arranging skin’). It could be argued that taxidermy had been around in some form or other for centuries, if you count in Egyptian (animal) mummies and the odd medieval crocodile in a church – the latter was probably a reference to the biblical Leviathan. French explorer Pierre Belon described a rather crude method for preserving the skin of birds in his 1555 Observations, but taxidermy only truly became an art form in the nineteenth century, when travellers wanted to preserve their hunting trophies, stuffed exotic birds became a desirable home decoration, and naturalists started to see the educational value of preserved animals. 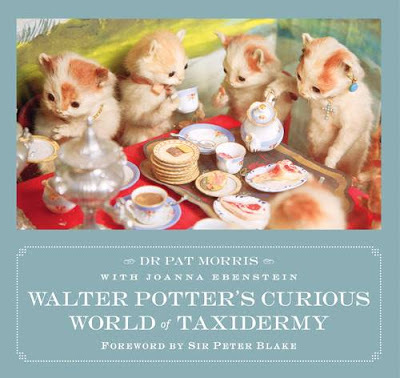 The most curious offshoot of the practice is probably the anthropomorphic taxidermy of Walter Potter. Although many people now categorically reject killing animals for hunting trophies (and rightly so if you ask me), Victorian taxidermy has become a collector’s item, and taxidermy is still important for contemporary museums of natural history and education purposes. As I am interested in he skills underlying material culture, I wondered whether taxidermy was difficult to learn, and whether techniques and materials had changed much since its nineteenth-century heyday. That is how I recently ended up in a nature education centre for forty-eight hours, taking an introductory taxidermy workshop with the Dutch Society of Taxidermists. I didn’t really know what to expect – a bunch of guys who usually spend their weekends stuffing animals in their sheds maybe? It was a pleasant surprise to find a team of both male and female instructors ranging in age from early twenties to late sixties, and a similarly varied group of participants eager to learn the basics. Students, nurses, IT consultants, artists, foresters, researchers, shop assistants, farmers, a gallery owner, a surgeon, all fascinated by the possibility of giving a death animal a second life. In the Netherlands, all indigenous animals are protected by law, and can only be preserved by a certified taxidermist upon gaining a police declaration. Therefore the animals used for instruction during the weekend were either ‘pests’ (grey squirrels, muskrats, moles, skunks) or tropical birds bred in Europe that died from natural causes. After selecting our animals and an introductory lecture on Friday night, we got to work on Saturday. After making an incision on the back or belly of the animal, the skin has to be carefully separated from the subcutaneous facia. The skull has to be taken out and cleaned thoroughly, as this is included in the artificial body on which the skin is mounted. The artificial body is made using wire, straw, yarn and clay, with the measures and shape of the skinned body as a starting point. The skin is washed, tanned and dried, and glass eyes are put into the skull. Subsequently the skin is fitted onto the artificial body, adding and removing straw and clay to reach the desirable effect. Finally the skin is carefully stitched close and the animal mounted on a pedestal or branch. Although it all sounds pretty straightforward, it is a very precise job, and it is incredibly difficult to obtain the desired result. I am pretty happy with how my squirrel came out, but I had help from experienced instructors, and she’s certainly not the prettiest piece of taxidermy. Of course I grilled the instructors about how they learned themselves, and the answer was without exception: practice. Taxidermy is truly an art in the Aristotelian sense: a skill that can only be learned by doing. Of course there is theoretical knowledge about materials and rules involved, but the actual taxidermy is mostly tacit knowledge. Interestingly, when I compared what I had learned to early twentieth-century taxidermy handbooks, I noticed that the process has not changed substantially since – but fortunately the arsenic formula formerly used to preserve the skin has been replaced with healthier alternatives since. 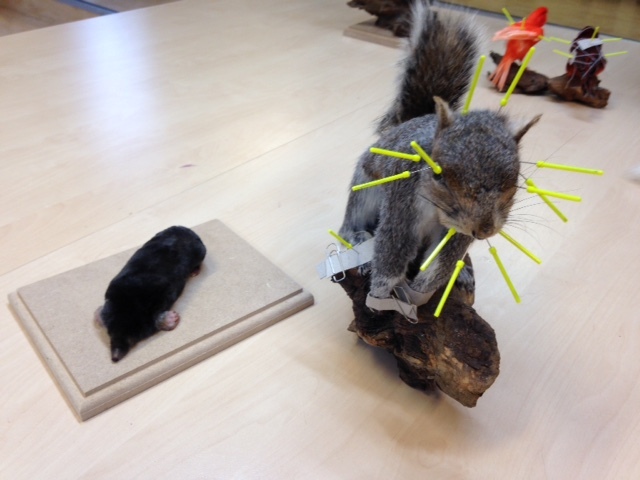 I doubt that I will be able to commit to becoming a professional taxidermist – but a fascinating excursion it was! A lot of entertaining stories and theories circulate about the presence of stuffed crocodiles in churches, yet the theory that these ‘monsters’ were seen as the embodiment of the biblical Leviathan seems to make most sense. See i.e. Amelia Thomas, ‪The Zoo on the Road to Nablus: A Story of Survival from the West Bank. PublicAffairs, 2008. For an introduction on the history of taxidermy, see Pat Morris, Taxidermy. Art, Science, and Bad Taste. MPM Publishing, 2010.